Congolese-born professional basketballer Serge Ibaka made history in 2008 as the first player from his native country to be drafted by an NBA team. Subsequently, he had an illustrious 7-year stint with the Oklahoma City Thunder followed by a 9-month stint with the Orlando Magic. The talented player joined the Toronto Raptors midseason in February 2017. Among other highlights of his career, Serge Ibaka has led the NBA in blocks in 2 straight seasons and has thrice been named on the NBA All-Defensive First Team. On the international front, he plays for the Spanish national team and he won a silver medal with the team at the 2012 Summer Olympics. Serge Jonas Ibaka Ngobila was born on September 18, 1989, in Brazzaville, Republic of the Congo. His parents are Amadou and Desiree Ibaka and they were both professional basketball players in their prime. His is a relatively large family as he has a total of 17 siblings. His mother passed on when he was very young and his father got jailed as a political prisoner during the Second Congo War. In a bid to escape the tragedies in his life, the young Serge Ibaka began playing basketball at a club named Avenir du Rail. The talented youngster also made it to the youth team of his native country Congo. At age 17, Ibaka relocated to France where he had a brief stint with a second division basketball club. Afterwards, he moved to Spain where he had a brilliant 2007-08 season with second division basketball team CB L’Hospitalet. He played in a number of international showcases during the 2008 offseason and thanks to his impressive performance, he caught the attention of several NBA scouts. Serge Ibaka was selected by the Seattle SuperSonics in the first round of the 2008 NBA draft as the 24th overall pick. His selection was a historic one as he became the first player from the Republic of Congo to join the NBA. Six days after the draft, the Sonics were replaced in the NBA by the Oklahoma City Thunder as the team relocated from Seattle, Washington to Oklahoma City. The Thunder decided to keep Ibaka in Spain and consequently, he signed a 3-year deal with Liga ACB basketball club Ricoh Manresa with the option of leaving at the end of each season. In his first and only season with the team, the talented player averaged 7.1 points, 4.5 rebounds and 1 block in 16 minutes per game. At the end of the 2008-09 season, Oklahoma City Thunder facilitated Ibaka’s return to the NBA by paying his buyout and also signing a 2-year deal with him. In his first season in the NBA season, Serge Ibaka made 73 appearances and averaged 18.1 minutes, 6.3 points, 5.4 rebounds and 1.3 blocks per game. He averaged the most blocks among all rookies in the 2009-10 season. In the following season, his scoring average increased to 9.9 points, 7.6 rebounds and 2.4 blocks per game. During the 2011 NBA lockout, Ibaka moved to Spain where he had a brief stint with Spanish basketball team Real Madrid Baloncesto. He returned to the NBA at the end of the lockout. Ibaka featured in all 66 games of the shortened 2011-12 season, recording the highest blocks average in the league, 3.6 per game. In the 2012-13 season, he averaged 13.2 points, 7.7 rebounds and a league-leading 3.0 blocks. He trumped his previous performance in the 2013-14 season during which he averaged career-best 15.1 points and 8.8 rebounds per game and also recorded the league’s highest total number of blocks (219). He equally averaged 12.2 points, 7.3 rebounds and 2.4 blocks during the 2014 playoffs and his performance earned him a third consecutive NBA All-Defensive First Team selection (2012-14). In an injury-marred 2014-15 season Serge Ibaka averaged 14.3 points, 7.8 rebounds and 2.4 blocks per game. He didn’t fare any better in 2015-16 regular season during which he averaged 12.6 points, 6.8 rebounds and 1.9 blocks per game. His 7-season career with the Oklahoma City Thunder came to an end in June 2016 when he was traded to the Orlando Magic in return for Victor Oladipo, Ersan İlyasova as well as 2016 draftee Domantas Sabonis. Ibaka made 56 total appearances for the Orlando Magic during the 2016-17 season, averaging a career-high 15.1 points, 6.8 rebounds and 1.6 blocks per game. He was traded to the Toronto Raptors in February 2017 in exchange for Terrence Ross and a subsequent first-round draft pick. For the remainder of the 2016-17 season, he made 23 appearances for the Raptors, averaging 14.2 points, 6.8 rebounds and 1.4 blocks. The 2017-18 regular season was Serge Ibaka’s first full season with the Raptors and he averaged 12.6 points, 6.3 rebounds and 1.3 blocks per game. Relationship With Keri Hilson, Is He Married? 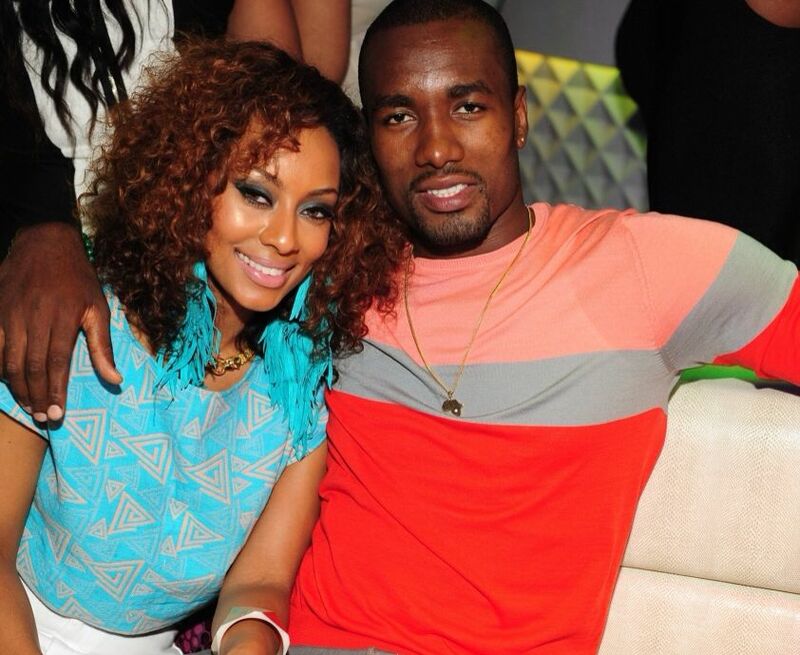 For some reasons, Serge Ibaka’s best known romantic involvement was with singer-songwriter and actress Keri Hilson. The celebrity duo got together back in 2012 and after dating for 2 years, they had their first split in early 2014. Despite the breakup, they didn’t stay apart for too long as the picture-perfect couple reunited in April 2014. After 2 more years of dating, Ibaka and Keri Hilson called it quits again in November 2016, bringing a final end to their 4-year romance. No reasons were given for either of their breakups, however, there have been allegations of cheating in the media circles. For now, Serge Ibaka still remains unmarried. However, it is uncertain if the NBA star is single. He was linked to reality TV star Angela Simmons in early 2018 but the fate of that alleged romance remains largely unknown. Serge Ibaka has a teenage daughter named Ranie Ibaka. She was born in the Republic of Congo a few months after her now-famous dad left the country. Interestingly, Serge was not made aware of the birth of his child until she was 8 years old. Apparently, his family chose not to inform him for the fear that he might abandon his budding career and return to the country. His father Desiree Ibaka took care of the child’s upkeep while he was away. Serge Ibaka has since connected with his daughter which gives him ample opportunity to make up for lost time.